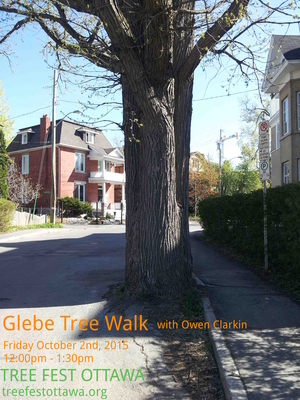 On October 2nd, come out with long time Tree Ottawa Champion supporter and tree educator Owen Clarkin for a guided tour of the different types of trees in the Glebe neighbourhood. Owen is a noteworthy supporter of Tree Ottawa by agreeing to be a Tree Ottawa Champion. He is the current Chair of the Ottawa Field-Naturalists Club and has an interest in the history of trees. As well as sharing his knowledge about specific trees, Owen will provide information about tree ownership and care, and the value of trees to homeowners, the community and the city. Owen’s love of nature and his extensive tree knowledge are profiled in the PhotoSynthesis photography exhibit. Come meet at the Photosynthesis Photography Exhibit in the Civic Gardens, Landsdowne Park at 12-1:30pm.